The Dr. Assmann paper1 demonstrates the significant wall sheer stress reduction of Optiflow through a comparison with a standard aortic cannula. 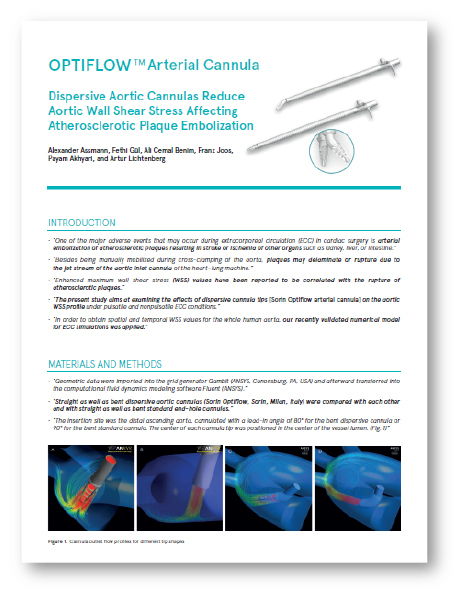 It shows how Optiflow reduced the maximum and average aortic wall shear stress values by approximately 50%, compared to the control cannulae. The benefits of lower shear stress include the potential to reduce ECC-related complications such as stroke, endothelial damage and hemolysis.